"The tournament went well, as always at the highest level. I liked it very much, I met a lot of friends, chatted a lot. There was a great sports atmosphere. Igor Mazurenko once again proved that he is able to do great tournaments". "The injury I received while fighting in ultimate on my left hand. In the category I pulled fine without any problems. 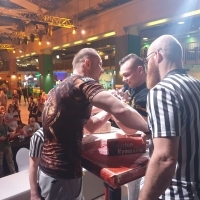 The first match in ultimate class was with Oleg Zhokh, he was perfect for me. Oleg was surprised that I opened his wrist. Then I went to Vitaly Laletin and when he pinned me, I was injured - stretched and microteared of the pectoral muscle. Of course, the injury interrupted me, after it I could not continue further fights on the left hand. This injury knocked me out. On the second day of the fight I used painkillers and massage. We wanted to make the taping, but not found in pharmacies tapes, so as much as possible we used usual plaster". "Despite all this, the injury prevented me to fight even on my right hand and I was able to compete only in the category. When fought with Andrey, then I was comfortable only when the grip was on the center of the table. I could not make the movement of the attacking toproll, but I was able to pin him in the triceps". Dmitry managed to defeat his principal rival. "To the fight with Andrey I started to prepare immediately after our armfight with him, for me it was a matter of principle. The injury did not allow me to give everything to the full, and show everything that I'm ready for, but I'm happy with my result. I held Andrey, attacked and pinned him". "I was surprised by Vitaly Laletin, very unusual opponent. He has very long arms, and he is constantly progressing. In general, our whole team was well. I am pleased with the performance of my pupil - Katerina Lyakhova. She was a little nervous, but gathered and showed a good fight. I would say that the hero of the tournament is Michael Todd, due to the fact that he has very serious injuries and still came to the tournament and pulled. He is very strong-willed athlete, I know what it is - to fight through the pain". "Ultimate composition was very good. In general, I didn’t pull there. The next time I will try to prepare better and show my strength not only in the category, but also in ultimate class". "This year the season is over for me. My next goal - is to recover as quickly as possible and start preparing for next season. They expect to win. I would like to thank my fans, my family, relatives and friends. They have always supported me. I'm going to do next, and try not to let anyone who cheers of me. Also many thanks to my coach - Ahmed Aliev. He spent a lot of effort and nerves for all this. He was worried about me and all of us. And as always - meat, testo and iron joints by Dmitry Trubin". It remains for us to wait for the new season and the new Dmitry’s victories. Stay with us and stay tuned to armpower.net.